A: RBB is mahagony and crystal clear, with a white head that holds up, but is rather thin. S: bouquet is faint, yet somehow screams excess; excessive sweetness. Caramel and pecans are over-done. T: A cloying combination of caramel, pecans, and brown sugar, topped off with a metallic twang. This is the epitome of under-attenuation. D: definitely not a fan of this overly sweet brew. Avoid, unless you like beer that hides its beer flavors. Lacing beautifully tops the reddish brown beer, inviting you as it displays its clarity. Toasted bread hints toward a mild roasted aroma in the nose, even mild chocolate, perhaps? Flavors jump from caramel to chicory, to toasted grain. Hops dig in a little bit with a citric twang and a mellow spicy bitterness that seems to grow with every sip. A hint of fruit and a kiss of alcohol rest in the middle of the palate. Toasty flavors leave a long trail of flavor in the semidry after taste. A big Brown Ale that keeps to the lighter toasted and slightly roasted malt spectrum. Very pleased to run into this beer, as there are not enough Brown Ales to be had nor great versions like this one. It pours a pretty good amber colour with a moderate head that leaves a decent amount of residue on the glass. The aroma is malty, a touch sweet/fruity and adds some hops throughout as well. Not bad overall. The flavour is a nice mix of the aromas. This one is not overly hoppy but the hops are certainly present at times and bounce back and forth with the malt as to which one dominates the palate. General sweetness lingers throughout with fruit flavours becoming more noticeable toward the finish and as this one warms a bit. Mouthfeel is medium bodied and crisp with touches of chewiness. Overall, this one was enjoyable and probably the ABC brew that I would go back to the most. Give it a whirl. 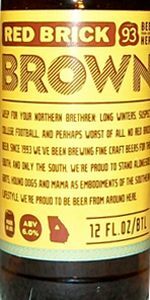 Brown ales are generally the Rodney Dangerfields of the beer world - they get no respect. This beer offers a well-balanced flavor profile with a bit of toffee and milk chocolate lurking in the background. Finish was clean. Not a terribly memorable beer, but then again brown ales are the workhorse of the beer world. Poured into a nonic a full amber/bronze with a nice tight formed 1/2 finger slight off white head,downhill from there.Faint caramel in the nose and thats about it and its very faint at that.Thin prickly mouthfeel almost to the point of watery,flavors are well watery with a bit of roast and faint caramel sweetness with a touch of butter in the finish.I thought this might be a decent lunchtime brew but in all honesty its just not very good. Smelled light a wet dog. This really bothered me. Other than that, it was fairly similiar to St Arnold's Brown Ale. Very lackluster. It pours a good-looking dark amber/reddish copper with a nice off white full head that sticks around and laces rather nicely. The aroma was of nut and malt. The taste was sweet, malty with hints of nut, caramel and toffee. They throw in a nice soft round of hops to balance things out. The mouth is left with a nutty feel. I found this beer worked well with pasta or pizza with extra cheese. On its own the beer was almost to sweet and the 5.9% abv seemed slow to be noticed. Thats why I say, a good dinner brew. For once I was actually glad about a flight delay at Atlanta. As I ran past the little brewpub on the way to my gate, I wished I could try one. Well, low and behold, my wish came true. In fact, even better, I had time for two! This coppery/red brew has a full rounded malt body and is abundantly hopped. Hints of sweet caramel roll forward along with the trace of coffee. The off-white head doesn't last very long. Good, but short lasting malty nose. Fairly complex ale. Deep copper color on the pour, the head impressive, but it disintegrates quickly leaving some lumpy lace that tries to cover the glass but it fails miserably. Malt and crisp is the nose, start is sweet, the top middling in mouth feel. Finish is stern in its acidity, hops are apropos for the style with a dry somewhat bitter aftertaste. This would make a fine Everyday kind of beer, which is not all bad. Beer pours a nice red color with a decent tan head. Good lacing. Good looking beer here. Beer smells nicely of malts and just a smidgen of hops. I also unfortunately pick up an off cooked corn type aroma. It is faint, but enough to be noticed. Taste is solid. Malts seem to predominate as the beer tends towards sweet. I would like a little more hops to put the beer in balance. Beer is smooth and carbonation seems right. An easy drinking and nice beer to have while in Atlanta. Appears a copper toned amber with a small, off-white head that fades into a mild cap and collar. Scattered streaks of lacing are left around the glass. Taste is of the mentioned aromas with a mild corn husk flavor breaking through and dragging the brew down slightly. Mouthfeel is medium bodied, smooth, sugary, lightly bitter, nicely mixed and balanced. thanks to Ding for the brew! I am sampling a cellar temp bottle poured into a pint glass. Pours a clear amber color with some deeper ruby highlights. Big fluffy beige heead of 2 cm foams up with only slightly aggressive pour. Fades slowly leaving tight lattice on glass and craters on the surface. Maintains a very nice creamy appearance throughout sampling. Aroma is malty with caramel and some nuttiness. I also get some herbal hops, fairly well balanced. First sip reveals an average body and smooth texture, with fine tingly carbonation. Flavor is as nose advertises, some caramel malt and a bit of brown sugar followed by some grassy and herbal hops. Finishes a little dry and hop oil burps follow. A nice drinker that is well balanced. the hop burps get a little metallic towards the end which detracts from the experience a little, but still glad to have tried the beer. Had this while in Atlanta last week at the Earthlink Live. Pours a reddish brown, with a foamy off white head. Noticed sweet malt in the nose and a slight hoppy aroma. While I am not a huge fan of "red" ales for the most part, this one was slightly less sweet than the norma. Malts are up front and linger. Decent hops balance, but not enough for me. Finishes slightly cloying and sweet. Not a bad ale, but not one that i will seek out. It's probably a good choice for sessioning if at a pub and this is the best of the bunch, however. Reddish amber body topped by a foamy two finger head made this a decent looking beer. The lacing was well spread out along the sides of the pint glass. The aroma was mildly nutty and malty. The taste was soft, sweet, and evocative of apples, pears, and oranges. The mouthfeel was soothing, and a hint of smoky roastiness could be detected in the aftertaste. Easy to drink, and not dumbed down, for some reason I had never sampled this local staple until now. The loss was all mine. An almost massive exodus of butterscotch aromatics hits my nose as I pour this beer. The beer is a brilliantly clear, deep brownish amber color. It is topped by a thin, quickly disappearing tan colored head. Ok, back to the aroma; this beer is just absolutely dominated by butterscotch. I would guess it is from diacetyl, but for some reason in this beer it is not bothering me that much. I don't get that rancid butter note that I typically would in a diacetyl ridden beer. Try as I might, I can't pick out any other aromatic notes underneath all of the butterscotch. The taste is lightly fruity up front, with a pretty solid berry component to it. In fact the finish reminds me strongly of strawberries. Also in the finish is a dry, toasted grain husk note that almost dries the mouth out a bit. The butterscotch diacetyl notes are not as noticeable in the flavor, or I should say that it is not singularly so dominant that I can't taste anything else because it is quite evident in the taste as well. Again it does not really have that rancid buttery note that most diacetyl prone beers have. The notes that are here seem to amplify the fruitiness. In fact I think the over the top berry notes are a direct result of the diacetyl. This is an interesting taste experience for me, It is totally dominated by the diacetyl yet remains drinkable, which is certainly a first for me. A 12 oz bottle from a trade with Phatz. A: The ale is a deep amber color, looking like the bottle that accompanied the beer. The head was not sizeable but has maintained nicely, lacing the first 1/3rd of the glass. S: The nose is toffee malt, touched with caramel and nut aromas. T: The taste takes the brown ale up a notch. While the nose was bland and average, a great deal of flavors jump out as I sip the ale. Caramel malts add depth, a sweetness that has darker, fuller flavors that could easily pass stronger ale. Dark malts linger in the mouth for a long time after the sip is gone, giving the ale a taste that could be taken for a stout. The finish keeps the long malts flowing, lingering long after the glass is empty. M: This is a real surprise, a solid beer with a nice taste that keeps the tastebuds jumpin'. D: I'd gladly sit and drink a few more, this is a nice quaffer. Bottle pours a clear chestnut body with a small beige head. Nice spiderweb lacing. Aroma is milk chocolate and soft citrusy hops. Light medium body and moderate carbonation. Taste has a bready brown sugar maltiness. Earthy hops lend a restrained bitterness. Not bad. Equal parts coral and orange with a light haze from the yeast. Most browns are some shade of orange, but they aren't usually this rosy red. The ecru colored crown, although compact, is whipped creamy and hangs around for a bit. It also does a pretty good job of decorating the glass. One sniff is all it takes to identify Red Brick Ale (now Red Brick Brown Ale) as a brown ale. Trouble is, it's more sour smelling than sweet and doesn't have any nuttiness whatsoever. Since this is ABC's flagship beer, the nose has to qualify as a letdown. Nope, not impressed. With an ABV 'slightly less than 7.0%', according the website, RBBA doesn't taste very big, rich or malty. These guys have been hit (Red Brick Winter Ale) and miss (Red Brick Blonde). Looks like this brown ale is one of the latter. Tart and bitter are roughly equivalent, with sweet trailing far behind. There's a bit of cocoa, but no real chocolate or coffee, as the brewers would have us believe. Since they've used '7 roasted malts', one would think that they would've added enough barley to make the beer at least semi-burly. As might be expected given the preceding paragraph, the mouthfeel is too thin. Even for a 5.0% English brown ale, not to mention one pushing 7.0%. The bubbles seem a little fizzy, but the total amount of carbonation is fine. Red Brick Brown Ale was ABC's original beer, having first been brewed in 1993. Either I got ahold of a bad bottle or it's a mystery how this 'flagship' brew has survived over that many years tasting like it does. No thanks. A big thanks to BA Phatz for bringing this down. Appearance: Dark amber in color, looks like strong iced tea in the glass. Topped by a 2 finger, meringue like off white head, looks very thick and creamy. Thick, sticky lacing clings to the glass. Smell: Big chocolate nose upfront with and underlying sweetness, brown sugar comes to mind maybe some toffee thrown in for good measure. Taste: The beginning is full of chocolate with hints of brown sugar/caramel giving it a nice malt backbone. The middle has a nice hop bite that balances the malty beginning. Hops have an earthy quality about them. The finish, I have to say, is where some oxidation rears its ugly head. At 1st I thought it may be a bit of roastiness but it has more of a wet cardboard taste than roastiness. No fault of the brewer. I've had this in the fridge for a few months now. Anyway, it still finishes decently with more hop bitterness that lingers for a while on the tongue along with a bit of bittersweet chocolate. Mouthfeel: Medium mouthfeel, smooth, nicely carbonated. Drinkability/Notes: Wish I had a fresh bottle. No best by date listed. Still its a pretty good brown ale. Has plenty of chocolaty malt with a nice subtle underlying sweetness. Fairly hoppy in the middle and the finish with an earthy quality and lingering bitterness. Overall, not too bad considering the oxidation. Would like to try this again. Check it out if you get a chance. Definitely worth a try. Slightly sweet and malty aroma. Thin body, slight maltiness, slight bitterness. Dry finish with some graininess. Almost smoke like aftertaste, very strange. I just don't see a whole lot to this beer. I've never been the biggest fan of red beers and this does nothing to change that. Worth a try, I guess. I had this at Atlanta's airport. It poured from the bottle a dark amber topped by a thin off-white head. The aroma is primarily dark caramel. Almost a toffee character with just a touch of citrus. The taste replicates this. Dark caramel, with just a light bitterness. The finish blends the two. The mouth feel is surprisingly rich. Decent drinkability. I'm not a huge fan of amber ales. Most are boring, not offensive. This is a decent beer, nothing remarkable. Drank this one in Atlanta airport on a three hour layover. Pours a coppery amber with a thick, tan head around two fingers tall. There is a good amount of lace which covers the glass. There is a good amount of carbonation. The aroma is nice and different - sweet coffee, molasses and caramel. The taste is good - malty with a caramel taste. Slightly hoppy. I drank two of these and by the time my flight was over, I regretted it. It's true what they say about alcohol and flying. They don't mix. A good beer, however.